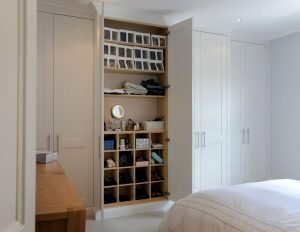 Your bedroom wardrobe is an element of your home you’ll interact with most, yet it’s amazing how many of us don’t think about making it work best for our individual lifestyles. 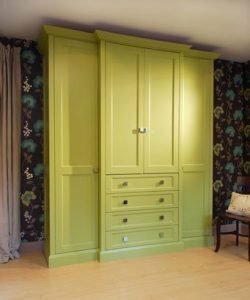 A handmade bespoke wardrobe is one of the best ways to efficiently use the space you have, so let’s look at the subtle intricacies to consider when choosing and designing your ideal wardrobe. 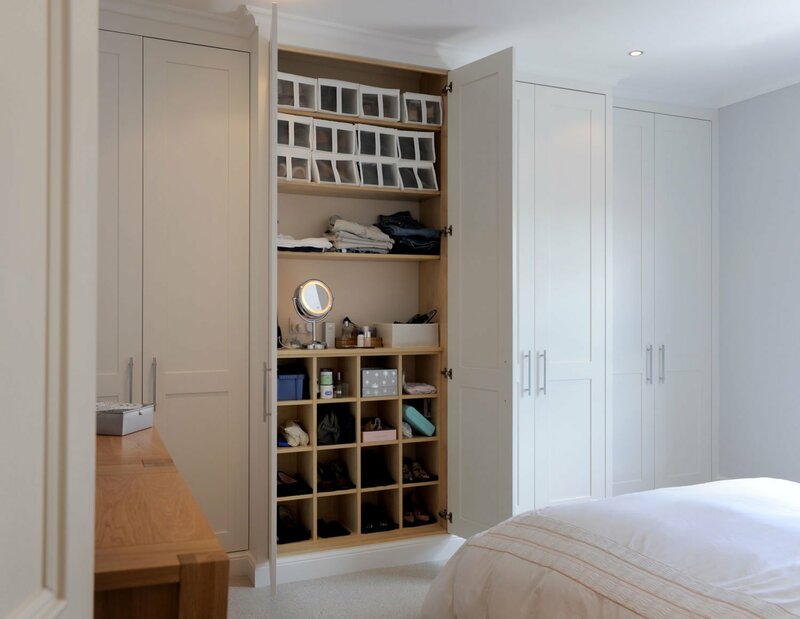 Before designing your perfect wardrobe space, we recommend a good old fashioned clear out, getting the balance between sentimentality and practicality right. Will you ever wear that dress or pair of trousers again? Marie Kondo has developed tidying up into an artform; if you need a little push – give her site a read. Once you know the amount of space you’ll need, it’s that much easier to create a wardrobe that fits you perfectly – a space that can breathe. 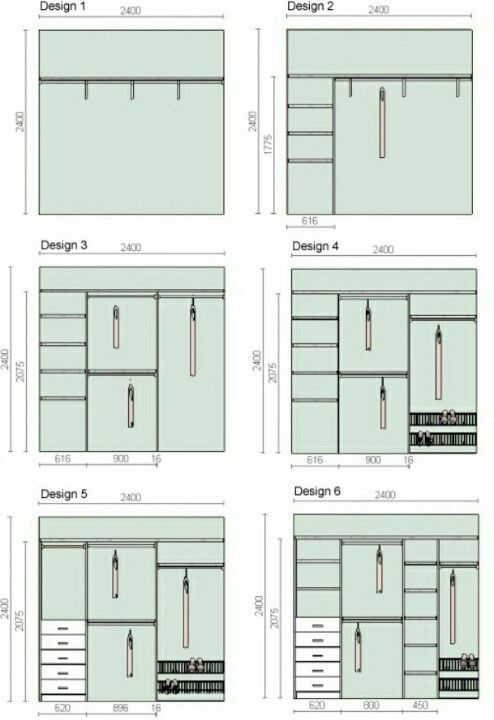 Once you know the purpose of your wardrobe and what you want to store in it, it’s time to draft up a design for the layout inside. Do you have a mix of blazers and long dresses for example? In which case you’ll want differing rail heights. Will you need shelving for polo shirts and sweaters; boxes and baskets for shoes, perhaps? Look at the makeup of your wardrobe and decide if you’ll need more rail or shelf space, or an equal mix of both. Segmenting your wardrobe so it’s fit for purpose prevents wasted space and increases storage opportunities. Start by laying long items – coats, dresses, trousers etc. – on the floor and measuring their length, the standard clearance to allow for most half height items is 1m. You’ll also need to consider their combined width and that you’ll need slide-room on the rails they’ll hang on. Next, pile t-shirts and sweaters into piles 25-30cm high – any higher and they’ll likely tip over. These will require 30-36 cm of depth in your wardrobe – with a standard wardrobe depth of 60 cm, you can get 2 stacks, one in front of the other. If you don’t have a firm idea of what you want for your wardrobe, you may wish to work with one of our designers to guide you. If the measurements above sound tight for the space you have, consider your folding technique. It may sound pernickety, but following Marie Kondo’s folding methods can help you to fit so much more into your space – who knows, maybe you can keep a few more things you were struggling to throw out! 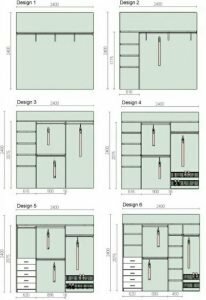 Colour schemes for open plan rooms are more complicated as you must decide where to stop and start different colour palettes and where to include feature colours. A good starting point is to choose a single accent colour for highlights throughout the room. Doing this on the exterior of your wardrobe space can deliver eye-catching results. If you don’t have space in your bedroom for freestanding furniture, such as a dressing table, you may want to leave room for some items other than clothing when you are planning your wardrobe interior. A wardrobe can also offer a dressing table space inside, and with a little electrical planning, you can keep hairdryers and straighteners on a large internal dressing table shelf. Also great for keeping makeup and toiletries behind closed doors, giving your room a cleaner, more minimal appearance. The interior and exterior intricacies of your wardrobe will be governed by the style of your room. We have a range of styles to inspire you – from traditional through to contemporary and modern. Take a look at our latest projects to find a home style that matches yours and let your imagination run free. As always, we’re on hand to help when you’re sifting through ideas, to bring you one step closer to the perfect wardrobe design for you.